After trying to rescue a drowning young woman, the the hero of Young Merlin is drawn into a fantasy world which is threatened by the evil Shadow King. Naturally, it is your job to save this world and also to rescue the aforementioned woman who has been kidnapped by the Shadow King. This is done in typical action adventure fashion: you have to fight enemies using spells that are gathered during the progress of the game as well as solve puzzles and use several objects. 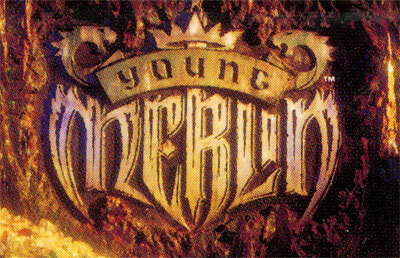 What sets Young Merlin apart from other action adventures is the fact that there is no text in the entire game, instead, icons are used to represent conversations, furthermore, the game uses passwords,instead of a battery to record the players progress.